Clarence Williams was an American jazz pianist, composer, promoter, vocalist, theatrical producer and publisher. In Clarence Williams’ early career, he worked at the local Vaudeville Theatre in New Orleans where he honed his skills as a pianist, arranger, and writer. 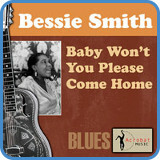 One of Clarence Williams’ most popular songs that we now call a jazz standard is ‘Baby Won’t You Please Come Home‘.